1. Earnings roll on: Newell Brands (NWL), SeaWorld Entertainment (SEAS), Sotheby's (BID) and Tyson Foods (TSN) will release earnings before the open. Hertz Global (HTZ), Marriott (MAR), Weight Watchers (WTW) and Zillow (ZG) will follow after the close. HSBC (HSBC) reported a pretax profit of $10.7 billion for the first half of the year, up 5% from the same period in 2017. SoftBank (SFTBY) said its operating profit surged nearly 50% in the first quarter, thanks in part to the sale of its stake in Indian e-commerce firm Flipkart. 2. 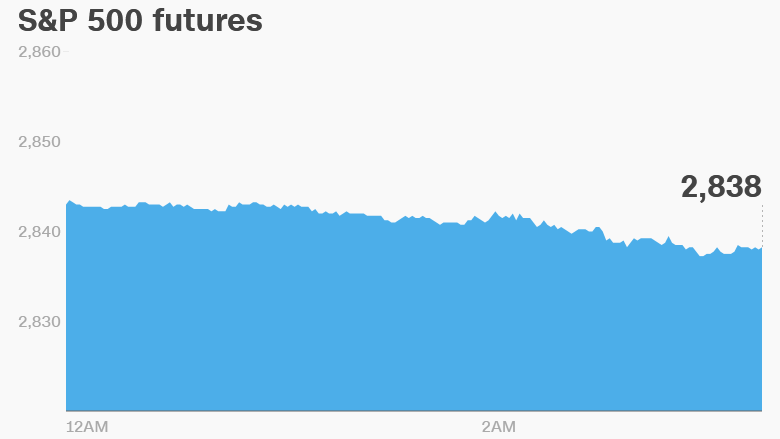 Global stock market overview: US stock futures were looking soft. European markets inched lower in early trading, with Germany's DAX dropping 0.6%. Data showed that German factory orders fell 4% in June compared to May. "Soft German orders data are reviving fears that the European economy is heading in the wrong direction again," said Kit Juckes, a market strategist at Societe Generale. Asian markets ended the day with mixed results. The Shanghai Composite shed 1.3%. The Dow Jones industrial average gained 0.1% last week. The S&P 500 and Nasdaq posted stronger gains of 0.8% and 1% over the week. 3. Stock market mover — Berkshire Hathaway: Shares in Berkshire Hathaway (BRKA) were set to jump at the open after the conglomerate released earnings on Friday after the close. The filings show that Berkshire's 5% stake in Apple (AAPL) is now worth nearly $50 billion. That's by far the most valuable stake it has in any one company. Berkshire's quarterly operating profits shot up 67% to $6.9 billion. Berkshire is led by Warren Buffett and operates in the insurance, utility, manufacturing and railroad sectors. It also has a vast investment portfolio. 4. Sanctions pain: The United States is reimposing sanctions on Iran on Monday, barring Iranian purchases of dollars and metals including gold. It will also prevent Americans from buying the Iranian currency, the country's debt and some Iranian goods. The sanctions are part of the Trump administrations' decision to pull out of a deal aimed at preventing Iran's development of nuclear weapons. More sanctions, mostly involving energy and shipping, will take effect November 4. The Turkish lira hit a fresh record low against the US dollar on Monday amid rising tensions with the United States. The US Treasury Department placed sanctions last week on Turkey's ministers of justice and interior over the detention of pastor Andrew Brunson.